Having a new baby can be a wonderful experience. However, it can be profoundly difficult for other kids in the family to accept this sudden and dramatic change. Here are ten things you can do to make the transition easier for your children. It is important for your other children to understand that you are having another baby and to have some grasp of the reasons why you made this decision. Children often worry that they are being replaced or seen as insufficient, so try communicating that the new baby will grow up to be a friend, playmate and companion rather than a competitor. You can help your children to relate to a new baby by sharing memories and images from the past. Tell stories about how your children used to need a lot of help before they were able to walk, talk and think, and that the new baby will need this attention too. These explanations also communicate that a new baby will not always need all of your time. 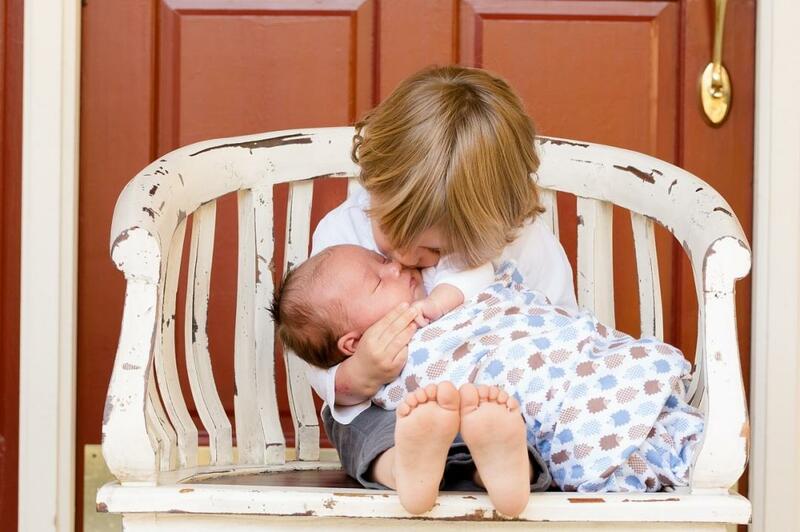 Children might feel comforted by seeing other good sibling relationships. Remind them of any close bonds you have with their aunts or uncles, and explain that they can enjoy these fun experiences with their own brother or sister. Cousins with younger siblings can also help to model happy sibling relationships. Show that you understand why your children might sometimes feel confused, left out or unsure while adjusting to the presence of a new baby. It’s important for your older children to know that such subjects are not taboo and for them to feel free to approach you if they want to ask questions or even just receive a reassuring cuddle. Helping with a new baby can ensure that children feel important and useful, and it can also help to build a strong bond. Assign your children simple and safe tasks or ask them to aid you with collaborative elements of childcare, all the while emphasizing how much you and the new baby appreciate this help. When your partner or other relatives can take care of the baby on their own for a while, spend some special time alone with your other children. This choice demonstrates that the older children are still very important and that you cherish their company. Some children wonder if a new baby will ‘take away’ your love, viewing love as a limited commodity. This worry is especially prevalent in only children who have no experience of sharing their parents. To help with this concern, you can explain that your affection for all of your children is limitless and that no one can ever steal the love you have for them. Sometimes, your older children will accidentally do something to wake the new baby or instigate an episode of crying. Try not to lose your temper and understand that your children probably just want to help. Your children might find it easier to adjust to a baby if they can imagine how they may play a significant role in this new person’s development. It can also help to explain that the younger sibling will grow up admiring all of the things that the older children can do. Finally, you can ask relatives to make sure they pay attention to your other children as well as the new baby. For example, relatives might want to include your older children in congratulatory cards, acknowledging their exciting new role as a big brother or sister. As is suggested above, a new baby can create unique challenges for the other children in your family. However, if you are sensitive to the needs of your older children, they can come to truly enjoy the experience of having a younger sibling.